I remember when people would argue that children’s (pre-teen) books were always going to be better on paper than in e-book form. Certainly, tactile input processing is different in children than in adults. There have pretty much always been independently published kids books in the Kindle store, but this is something different. It gives you the tools to make digital pop ups…and apparently, quite easily, based on the blurbs they have. 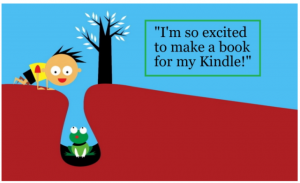 Of course, the market for fancy illustrated books is really for the Kindle Fire (at AmazonSmile: benefit a non-profit of your choice by shopping*) rather than the non-Fire Kindles…when you are talking illustrations (and animations) there is no comparison. However, this publishing will also let people put age and grade levels on their books, which will help even if it is more text-based. I’m a bit curious about that: can anybody just pick whatever they want? Age and grade levels can be very tricky. When our now adult kid was, oh, six or so, they were reading at a much higher level. The school librarian gave our kid a Goosebumps book…nightmare city! The reading level was more appropriate, but the material wasn’t. That’s what I mean by it being tricky. There are 163,828 children’s books in the USA Kindle store right now…I suspect we may see that grow pretty rapidly. I have no question that this is a plus for the authors. I think it will also be a plus for the readers…and since this is part of KDP, it ought to bump up the options for kids using Kindle Unlimited which is Amazon’s $9.99 “all you can read” subser (subscription service). If Amazon isn’t figuring out a simple way to gift memberships in KU for the holidays, they will really be missing a chance. This may also sell more Kindle Fires, and possibly the Amazon Fire Phone and even the Amazon Fire TV. There is a Kindle app for the former and not for the latter…but you could mirror a Kindle Fire to a Fire TV, and they may work out an app for books. Would you read a book on a TV? I could certainly see reading Chicka Chicka Boom Boom or a Dr. Seuss book to a room full of kids! I don’t think the people at Amazon are anti-p-book (paperbook), but it’s better for their business model to promote e-books. P-book distribution is still largely under the control of tradpubs (traditional publishers) and brick and mortar stores, although e-tailing is probably moving up (and will move up more in a hurry if Barnes & Noble or Books-A-Million collapse). If your kid is reading color, slightly animated e-books on a Kindle Fire through Kindle Unlimited, it really commits you much more deeply to Amazon. Then, maybe you become a Prime member (free month with that Kindle Fire…free year with that Fire phone). Once you’ve done that, you start buying the higher margin physical items from Amazon (or third parties fulfilled through Amazon) and the big A can start making a profit…without raising e-book prices all that much. They haven’t been raising the e-book prices generally…except for the New York Times bestseller hardback equivalents, which have shot up an extraordinary amount this year, based on my Snapshots. Let me ask this, though: do you still have p-books you got as a child? I do. I think a lot of people do…cherished (often “well-used”) parts of youth. That won’t quite be the same with digital kids’ books.